Wholesome Sweeteners' Organic SUCANAT, which stands for Sugar Cane Natural, is made by simply crushing the sugar cane, extracting the juice and rapidly evaporating the rich syrup to create a porous granule - SUCANAT. And that is it, nothing added and nothing taken out! A simple idea, really. Wholesome Sweeteners' Organic SUCANAT is made from 100% certified organic sugar cane grown in Costa Rica. 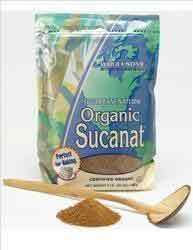 The SUCANAT is brown in color and has a distinct natural molasses flavor that enhances many foods. It can be substituted for sugar in any recipe and it is especially good in chocolate-based recipes, for baking and for BBQ sauces and marinades. It is an excellent source of iron, calcium, vitamin B6, potassium and chromium, which helps balance blood sugar. Wholesome Sweeteners' Organic Sugar is USDA and QAI organically certified as well as Kosher certified.